On the hundredth Anniversary of the British attack on the Dardanelles, we have John Bower's print (courtesy of the New York Public Library) showing the 1814 naval bombardment of Fort McHenry, in Maryland, during the War of 1812. I was lucky enought to find myself in Baltimore on the Canakkale anniversary, and only belatedly realized that the attack on Fort McHenry was, of course, America's Gallipoli: the two battles are enshrined in national myth, separated by almost exactly a century but united by a shared commitment to defend our countries against British seaborne invasion. 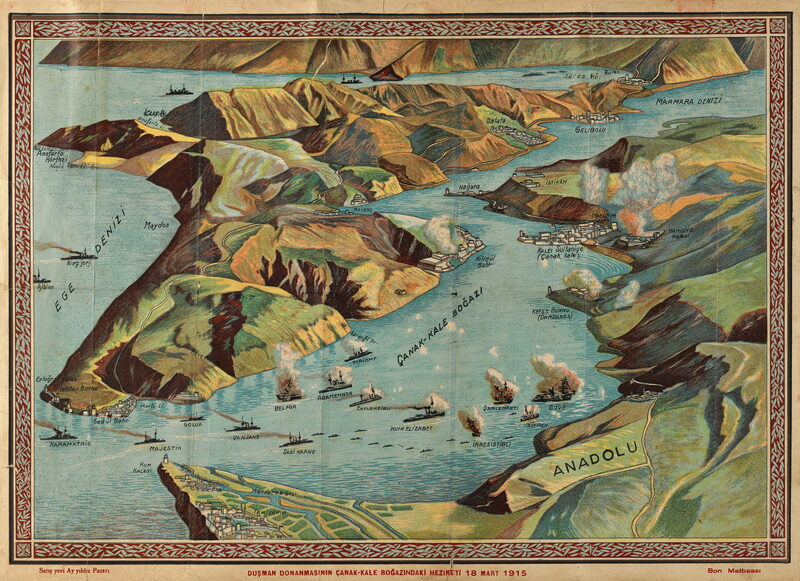 This print, in particular, reminded me of a fantastic commemorative map of the Dardanelles attack provided by Kerim Bayer.